The Camps have a New Equestrian Program! Camps Bernadette & Fatima are excited to be bringing the equestrian program back this year! The program will be based out of Camp Fatima with three horses available for campers from both locations to ride throughout the summer. Miriam Nelson will be running the program. She is a senior biology major at Franciscan University of Steubenville. Passionate about the sport, she grew up caring for, riding, and competing from a young age. 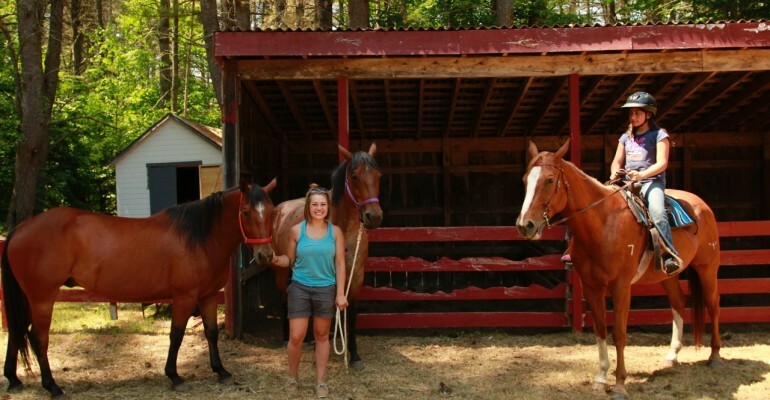 Miriam is trained in several riding disciplines, including English and Western riding and has been teaching riding lessons and training horses since 2011. She is very excited to jump-start the program and work with any camper wishing to participate. She has picked out three mild-mannered horses and will teach horsemanship and short riding lessons within the confines of the riding arena. In order to work with the horses, campers will be required to wear long pants and protective, closed-toe shoes (sneakers, boots, etc.). Helmets will be provided for campers when mounted. Any camper that is interested in participating in the program must provide a waiver signed by a legal guardian to interact with the horses. The waiver can be brought to camp on check in day. Horses are gentle giants; safety is our biggest priority and much emphasis will be placed on teaching campers how to work with them safely and enjoy the experience. For our Bernadette camp families, if your daughter is interested in participating in the program we will arrange for trips to be made to Fatima each session as well as on Bernie/Fatima days.